Griplok® tube fittings use a proven dual-ferrule compression seal to provide leak-tight connections and are especially suited to applications with high vibration such as gas transmission and turbines. Materials: 316 SS, Alloy 400, C-276, and brass. Other materials are available. Sizes: 1/16 to 1 in. Adapters: NPT, ISO/BSP, SAE/MS, AN, weld, O-seal, tube stub, port connectors, hose, and ORFS. Special fittings: Bulkhead and extended (long), bore through, positionable, calibration and dielectric fittings. 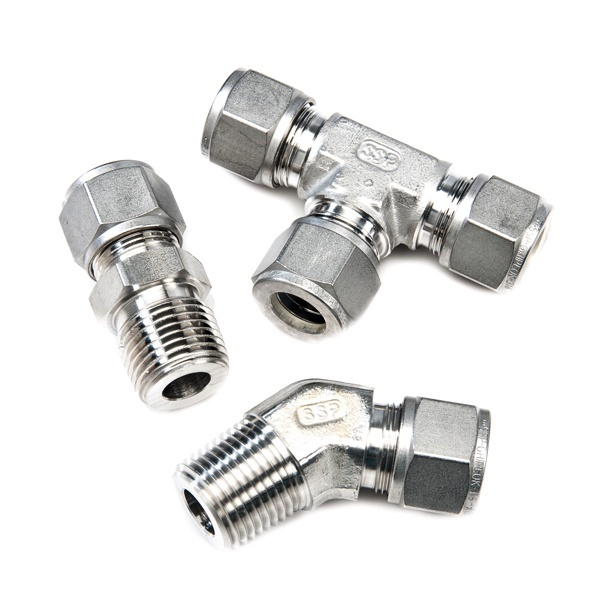 *Griplok tube fittings are rated to the maximum allowable pressure rating of the tubing they connect. Griplok tube fittings are designed, manufactured, quality controlled and distributed to be totally “interchangeable”with the Hoke® Gyrolok® brand of tube fittings. The precision manufacturing of both products to stringent tolerances under rigid quality control procedures ensures the safety, performance and reliability of service whenever Gyrolok and Griplok tube fittings component parts are mixed and used in accordance with published installation and service practices. Griplok tube fittings use a two-ferrule design with sophisticated geometry, precise machining, unsurpassed material quality, to provide a leak-tight remakeable seals even in applications having high vibration and extreme temperature changes. This leak-tight seal is the result of the sequential interaction of the nut, the front and back ferrules, the body, and the tubing. Griplok tube fitting straight configurations are machined from type 316 stainless steel cold-finished bar stock in accordance with ASTM A-276 and ASTM A-479. Elbows, tees and crosses, are machined from close-grained 316 stainless steel forgings in accordance with ASTM A-182. All 316 stainless steel. All components are heat code traceable. Certified material test reports (CMTRs) are available. SSP and SSP distributors provide extensive tube fitting installation training. The course covers tube fitting installation, tube selection and cutting and preparing tubing, and tube bending. SSP offers tools and accessories to support Tube fitting assembly and installation and tube cutting, preparation, and bending. See more about tools and accessories.